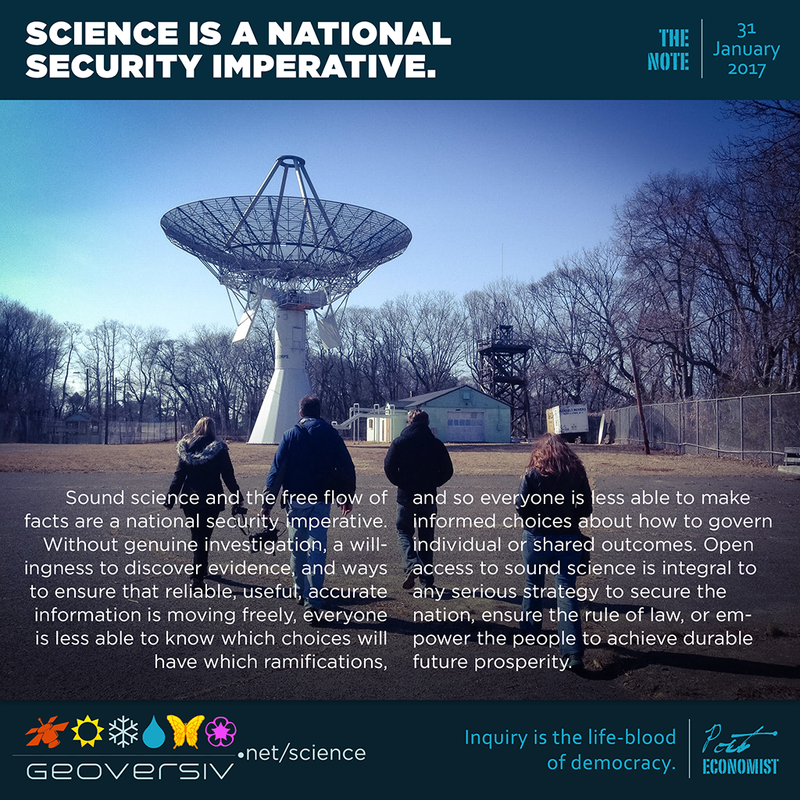 Sound science and the free flow of facts are a national security imperative. Without genuine investigation, a willingness to discover evidence, and ways to ensure that reliable, useful, accurate information is moving freely, everyone is less able to know which choices will have which ramifications, and so everyone is less able to make informed choices about how to govern individual or shared outcomes. Open access to sound science is integral to any serious strategy to secure the nation, ensure the rule of law, or empower the people to achieve durable future prosperity. For the philosopher and theologian Augustine of Hippo, there is no way to make virtuous choices or to do good in the world, except by fully understanding the nature, details, and ramifications of one’s choices, and then choosing voluntarily. Because science is knowledge, science unmolested by instruments of political power is a basic right and a path to virtuous action. For Mary Wollstonecraft, not only is the individual prevented from making virtuous choices by incomplete knowledge, but the limiting of anyone’s ability to seek and to know impairs the moral and practical freedom of all people in a society. Whether one looks to the Constitution of the United States or to the example of Nelson Mandela in stewarding his nation through the collapse of authoritarian segregation, access to justice requires access to truth. No government can operate legitimately without upholding this universal value. Attacks on scientific inquiry and open reporting are attacks on the integrity of democratic governance. The right to open inquiry, to investigative reporting, and to discovery of evidence in assertions of power, in whatever form, is where democracy begins. This is why the Bill of Rights works on so many fronts to protect against abuses of power that impede the fair and unbiased discovery of truth. In today’s highly integrated, wildly diverse planet-wide civilization, the capability to explore, assess, comprehend, and manage complexity is essential to making smart and ethical choices at every level—individual, community, national, and global. Industrial practices with incomplete impact-management strategies are propagating cost and harm in ways we can now see, trace, and understand. We can see how the chemical distortion of Earth’s atmosphere and oceans is trapping more thermal energy, causing warming, ice-melt, sea-level rise, and other disruptions. Coastal erosion and saltwater intrusion are affecting property, infrastructure, security planning, and agriculture. While small businesses, local economies, and even our ability to produce food for human sustenance, are increasingly challenged, major industries and complex banking conglomerates see costs increasing, and find it harder to produce new value for overstretched consumers. Science explains how this is happening, where the intersection of causes is driving change, and also how to address this deepening crisis in global disruption of natural life-support systems and human economies. The global climate security threat matrix—which we can now observe evolving in virtual real time—clearly shows us that science, inquiry, fact-based reporting, and freedom of information are essential to allowing us to achieve the levels of smart collaboration now required to solve basic civilizational challenges. We need always active open access to fresh, reliable, interrelated flows of information, if we want to achieve healthy outcomes, keep up with the rapid and accelerating pace of global change, and harness the technological advances flooding around us to build a future in which we are all better off, and not displaced by automation, resource scarcity and conflict. We are living an unprecedented opportunity to harness reliable science, open innovation, and transparent governance strategies, to graduate to a higher level of stewardship of natural systems, oppose injustice and ignorance, and secure a future of lived, routine democratic human liberty. Science, the free flow of fact, and the right to harness truth to make bold contributions to sustainable human wellbeing, are operational prerequisites to achieving security in our time. Only by ensuring these universal values are upheld will any of us enter into this healthier, smarter, cleaner, and more prosperous future. Inquiry is the life-blood of democracy. Science—inquiry subjected to testing and peer-review, open dialogue, and verifiable knowledge—is the leverage by which we achieve human liberation, sustainable cooperation, and dignity. Now, more than ever, we must protect truth, inquiry, and our right to access the best results of all that we have asked and answered. NOTE: The featured image on this page is from a visit to an old US Army base at Camp Evans, New Jersey. The Army Signal Corps developed long-distance radio transmission, radar technology, and using the dish in the photo tracked the Tiros I and II satellites, the first Earth-observing satellites devoted to detecting and reporting weather data. Camp Evans was the home-base for some of the most advanced science and technology innovations that helped the US win two World Wars. Camp Evans is a US Department of Interior National Historic Landmark and New Jersey’s designated World War II Living Memorial. It is also now home to the InfoAge Science History Learning Center.